Imagine striking a rich vein the first time you mine for gold. That was roughly the experience we had when, taking to the Web one day in search of potential editors for the Levenger Press edition of Samuel Johnson’s Dictionary we came upon Jack Lynch’s Web site. An English professor at Rutgers University, Jack seemed to know everything worth knowing about Samuel Johnson. Would he, we ventured in a subsequent email to him, know anyone who might be interested in editing our Dictionary? He just might, he responded, be interested himself. We’d struck gold. As it turns out, Jack does know just about everything worth knowing about Samuel Johnson and his time. Read on and enjoy a lively and insightful look into the Dictionary through the eyes of a Johnson scholar. Levenger Press: Who should read Samuel Johnson's Dictionary? Jack Lynch: Anyone interested in the English language. It's a kind of founding document, like the Declaration of Independence. If you want insight into the United States, you read the Declaration of Independence. If you want to know about the English language, you read Johnson's Dictionary. LP: But why read a dictionary from 1755 in 2002? Are there still traces of it in our language and in our Websters? JL: The age of Johnson was an important time for the English language. Historical linguists say we've been speaking modern English since around 1500, but the English spoken a century before Shakespeare doesn't look very modern to our eyes. For most readers, the language only starts to look familiar in the eighteenth century. So while it's fun to see the old-fashioned words that have fallen out of use, it's amazing just how much of Johnson's Dictionary is still relevant today. LP: Was Johnson the best man of his time to define the English language? JL: It's hard to imagine anyone better. He combined a scholar's knowledge with a poet's sensitivity to the language. And even though he spent his life agonizing over how lazy he was, who else had the energy to read through thousands of books and write tens of thousands of definitions single-handedly, in just a few years? LP: Harold Bloom refers to Samuel Johnson as the ideal reader. What role did reading play in compiling this dictionary? JL: Johnson was a remarkable reader. In fact, one of the most distinguished scholars of Johnson's Dictionary, Robert DeMaria, recently wrote Samuel Johnson and the Life of Reading, a study of his reading habits. Johnson read voraciously from early childhood until the day he died. So when he started working on his Dictionary, it was only natural that he should start by reading. He wanted to describe the language as it was used by the best English writers, so he read systematically through great mountains of books, and copied out hundreds of thousands of passages. We can think of the Dictionary as the world's most extensive reading notebook. 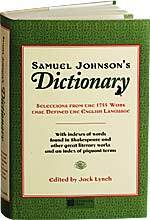 LP: Did they read Samuel Johnson's Dictionary in the American colonies? JL: All the time. James Basker, a scholar at Barnard College, examined the catalogs of 68 American booksellers in the eighteenth century. He found Johnson's works in 66 of them, and in almost every library catalog that survives from the period. It was so popular that Noah Webster felt stifled by its influence, and in 1807 he attacked it in a bitter pamphlet, to make room for his own distinctively American dictionary. LP: The original Dictionary had over 40,000 entries and was two volumes thick. The Levenger Press edition has over 3,100 entries and is 654 pages. How did you select which words to include? JL: I started by cutting most of the obvious definitions, like "slider: he who slides," or "backbone: the bone of the back." I also cut most of the derivative words: "savingly: from saving," or "unheated: not made hot." Entries like that helped trim the book by maybe 30 percent. Then I read through what was left. I was drawn to the entries that show how the language has changed in the last quarter millennium, to those that give us a glimpse of daily life in Johnson's London, and to those that show Johnson's analytical mind at its sharpest. I then went through a stack of books and articles on the Dictionary to see which words are mentioned by others. And after all that I read through the whole Dictionary twice to make sure I didn't miss anything. LP: Johnson once said his work was finished but not completed. What did he mean? JL: He knew that no dictionary could ever be perfect -- and even if it was, he knew that the English language is a moving target, and dictionaries would always have to be revised to account for the changing language. LP: Your three favorite words in this edition. JL: It's hard to pick just three. Of course I like all the famous entries, but editing the Dictionary showed me some less familiar ones. I always get a kick out of anatiferous, "producing ducks." Johnson's definition of defluxion as "a defluxion" is funny -- seeing a slip like that reminds us how rare such slip-ups are. And his usage notes can be a hoot. When he defines gratefulness as "gratitude: duty to benefactors" and adds "now obsolete," he leaves it ambiguous as to whether the word or the idea is now out of fashion. Jack Lynch is a professor of English at Rutgers University and a Johnson scholar, having studied the great lexicographer for nearly a decade. He is the author of The Age of Elizabeth in the Age of Johnson (Cambridge University Press) and the editor of A Bibliography of Johnsonian Studies, 1986-1998. He has also written journal articles and scholarly reviews addressing Johnson and the eighteenth century, and hosts a Web site devoted to these topics at http://andromeda.rutgers.edu/~jlynch/18th/. Dr. Lynch serves as joint editor of The Age of Johnson: A Scholarly Annual and as general editor of c18 Bibliographies On-Line. His doctoral dissertation on Johnson won the Diane Hunter Dissertation Prize from the University of Pennsylvania.